As a FirstEnergy company, Potomac Edison is committed to making customers’ lives brighter, the environment better and the communities it serves stronger. Potomac Edison delivers energy to nearly 400,000 homes and businesses in Maryland and West Virginia. Click here to learn more about switching utilities in Maryland. 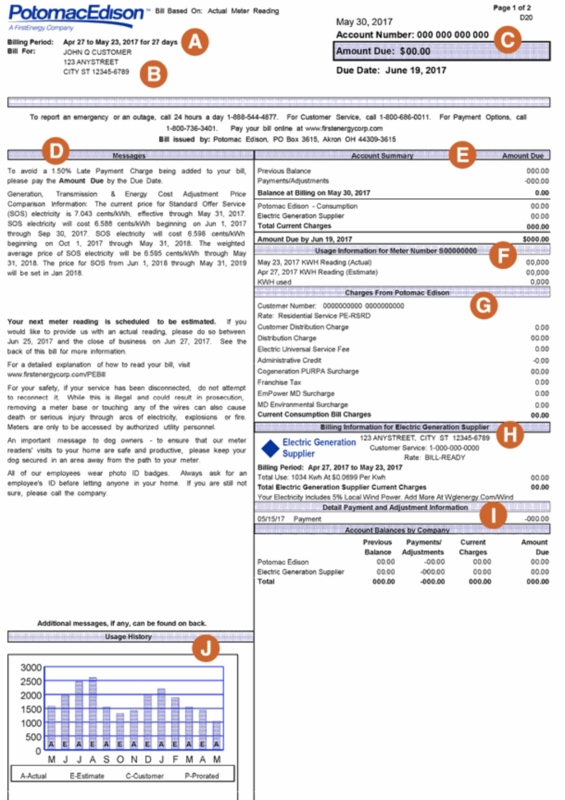 If you have questions on how to read your Potomac Edison energy bill, we can help. The most important portions of the bill are numbered and are explained below. Billing period is the time period for which your current charges were calculated. This is your customer name and address. The residential service number is what an energy supplier uses to transfer your account from Potomac default power to the supplier power. Be careful to only provide this number to people and companies you trust. The messages section contains information about your account. This is where you will find Potomac Edison’s Standard Offer Service Pricing here. The account summary includes your previous balance, as well as payments and current charges. In this section you’ll find your total energy cost for the month. If you divide this by the total number of kilowatt hours used for the month, you’ll know your cost total cost per kWh. Total use is the total number of hours of electricity your home used during this billing period. This section also tells you whether your usage was based on an actual or estimated reading. Supply charges represent the cost of the electricity itself, not including delivery and taxes. Before switching to a competitive energy supplier check this area to find out what Potomac Energy charges you for energy, and be sure that the competitive energy supplier is offering you a lower rate or a greener rate. If you choose an alternate supplier, these charges appear here. The detailed payment and adjustment information section includes any payments applied or adjustments made since your last bill. The monthly energy use in kWh is a summary of your use throughout the year. Use it as a way to tell if this month’s bill feels right or if it seems lower or higher than expected. This is the payment stub which should be detached and returned with your payment. This section includes your Account Number, Amount Paid, Amount Due and the Due Date. The explanation of terms section defines some of the key terms that appear on your electric bill. 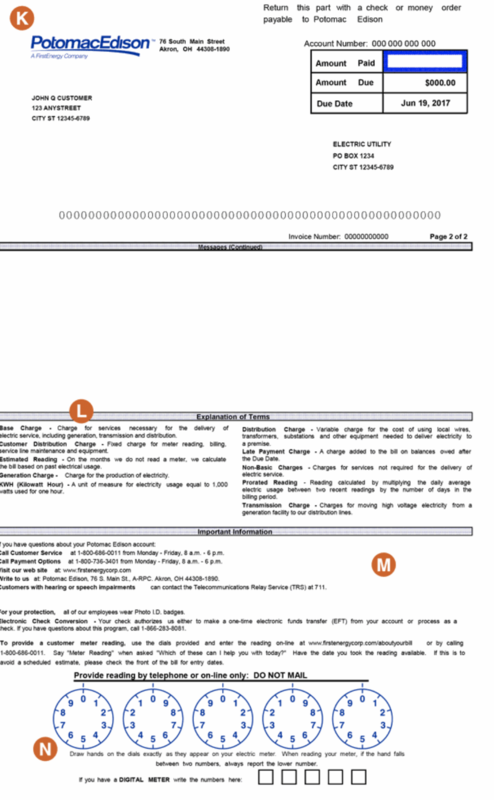 This section includes important contact information, such as phone numbers, website address, mailing address and other important information. You can use this section of the bill to record and submit your meter reading online, or call 1-800-686-0011. If you have further questions about your Potomac Edison bill, and would like to speak with Potomac Edison customer assistance, call (800) 686-0011 M-F 8am-6pm or contact Potomac Edison online.